I recently watched Hans Rosling’s programme “Don’t Panic – the Truth about Population”, where he tries to “make sense” of the population crisis. As he says: “I’m a statistician! No! Don’t switch off!” – ergo, data can be dull if it is not presented in the right way or if it simply cannot tell a story. Hans Rosling shows in the programme that “mankind is already doing better than you think” dealing with population crisis using a series of data visualisations. For instance, in the example below Rosling shows the changing average number of “babies per woman” between 1963 (5) and 2012 (2.5). Each circle represents a country (the larger the circle, the larger the population) and he visualises their movement up and down the axis. This Google spreadsheet from GapMinder holds the data linking country, population, and number of babies per woman between 1800 and 2012 (if held). Now, imagine if you have dozens of countries on there. Not pretty and not informative. This graph still doesn’t take into account the population size of the countries. 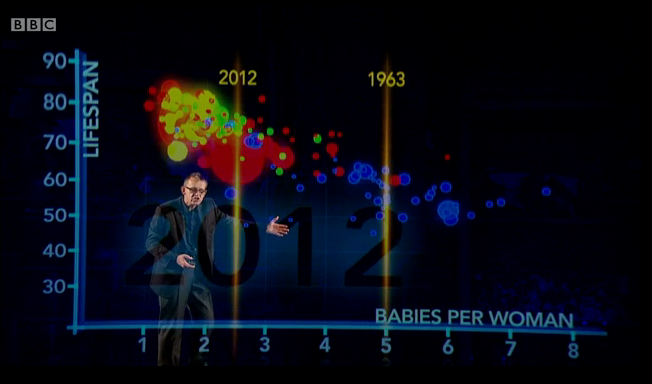 Isn’t Hans Rosling a genius for making it look so simple and approachable? I definitely think so! Tags: bbc, Data, Data Journalism, development, fertility rate, geography, hans rosling, iplayer, Journalism, Population, statistics. Bookmark the permalink.